The soul of Internet development is connection with a global user base thru keyword analysis. Keyword mining helps better manage inventory, prepare adequate content and identify user needs before the competition. In other to do so, you need to master the concepts of keyword head, body and tail. A lot has been said online about these concepts but most experts are failing to communicate a simple fact: the long tail is infinite. The head refers to exploratory searches that usually consist of one of two words describing a field: movies, music, art, myopia, etc. Ranking for head terms or phrases builds authority and can help in getting lurkers to discover your brand. The key is getting these visitors to subscribe or come back by providing incentives. While it’s very hard to monetize the head of web searches, a geo-targeted campaign is usually very effective. Location+Head Keywords (eg. movies + Tennessee) is a highly monetizable keyword; hence these short searches can be best taken advantage of in mobile devices. The body is comprised of hundreds of searches that have two to three words describing composite subjects. Examples include “cheap apartments”, “easy home fixes” and “quick and simple recipes”. When analyzing these keywords its clear the intent of the web user is to find a “special kind” of information within a broad field. Most body keyword searches include a qualifier and a head keyword search. The tail, or “long tail” is the most interesting of the three. Here you find gems such as “affordable dental services in Alabama”, “quick and simple solutions for single moms”, “buy gold in long island”, etc. The long tail is usually qualified multiple times. Therefore users that arrive to your site via long tail searches are usually very targeted and qualified. The head is thought of as the top 100 keywords in a field although this segment can include up to 1000 keywords (any set of words that you can monitor on a monthly basis or prepare a detailed strategy for). The top 10K to 100K searches are usually thought of as the body or middle of keyword searches. From there on, everything belongs to the long tail. While some analysts assign percentages to keyword categories (10-20% for the head, 10 to 30% for the body and the rest for tails), this is by no means set in stone. 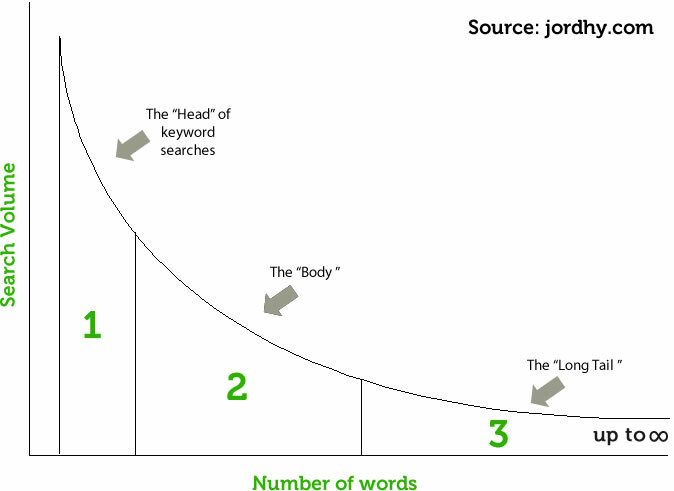 In fact, it is a common misconception that the long tail only amounts to about 50 to 80% of all keyword searches, because the long tail is infinite. Why is the Long Tail Infinite? Your long tail includes the list of targeted and qualified keyword searches that about 70% of your audience has used. You get to know about your long tail because someone made a page containing those very keywords. However, your competitors have a long tail too. About 70% of their traffic comes from those searches. Indeed, one key to doubling your traffic is exploring the long tail of your competitors and finding out the long tail of the industry. But why is the long tail infinite? Well, each day Google sees that 20-25% of searches are totally new. Everyday, people look to the Internet to satisfy new needs and desires. Yes, the long tail never ends and is a potentially infinite source of traffic. In part two of this installment I’ll show you how to capitalize on an infinite long tail. For a list of actionable research strategies and techniques, read the second installment of the series: The Long Tail is Infinite – Part 2.